Some patents are better than others. The best ones  irrespective of their degree of novelty  seem to possess a simplicity and elegance that makes them not only a powerful example of the Inventive Principles of TRIZ, but a spark in their own right to a host of inventive solutions to other problems. Many casing or pipework structures employ bolted flanges to join adjacent sections that at some point are required to be dis-assembled. Casings on gas-turbine engines are a particularly good example. Flanged joints between casings in such applications are required to seal against extremely high temperature and high pressure conditions across a wide range of operating conditions and loads. A typical gas-turbine flanged joint may require over a hundred bolts to ensure adequate functionality. Of course, the presence of such large numbers of bolts presents a considerable penalty to operators in terms of both the amount of maintenance time required to dis-assemble an engine and also a not inconsiderable weight penalty. From a design perspective, we may see flanges as a classic compromise situation; one in which the designer is trying to strike a delicate balance between a requirement for a large number of bolts to ensure adequate sealing and a desire for a small number of bolts in order to improve maintainability and reduce weight. In the fullness of time, some of these suggestions may operate (possibly in combination) to achieve an Ideal Final Result flange joint design (*). In the meantime, however, Inventive Principle Another Dimension was used to profound effect in offering the potential for possibly halving the number of bolts around a flange whilst maintaining the sealing performance. (*) For example it is already possible to seal a relatively low duty flanged joint with one bolt  using a V-band clamp type arrangement. One of the great beauties of this elegant idea is that it manages to solve the design contradiction without the need for any additional parts or complexity. In essence, all that has changed from a manufacturing standpoint is that the faces of the flange are formed at a slight angle to one another rather than being parallel. 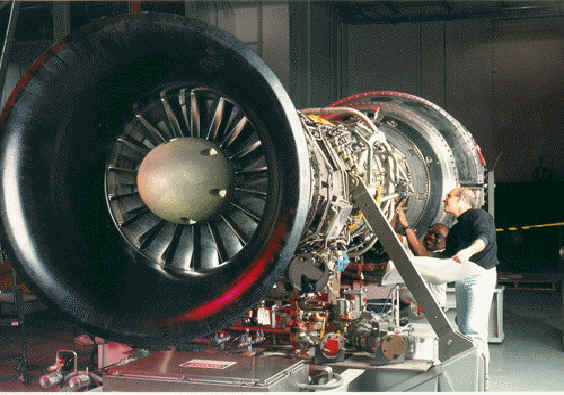 Tests on an prototype flange (reported at ISABE 1989 in Athens) demonstrated the ability of the design to not only seal a flange with around half the number of bolts of the traditional parallel surface flange, but to do it more effectively across the entire range of operating conditions a gas-turbine may be expected to face. Like some of the best examples in the Effects part of the TechOptimizer software, this patent provides an excellent demonstration of the Inventive Principles in action. It can also be used as a powerful spark to help solve a wide range of other types of problem; self-locking nuts and a novel valve seal to name but two upcoming examples.